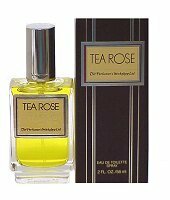 Perfumer's Workshop introduced Tea Rose in 1975. This feminine scent possesses a blend of spicy warm florals. Tea Rose is recommended for daytime use.